Oh! the joy of the chase. Especially in the fall, when the morning air is sharp and cool. The excitement begins upon arrival. The hunters disembark from their trailers, greeting strangers and friends alike with animated snorting and the occasional squeal. A gelding ranges too close to a mare, who nips him in outrage. The poor fellow shivers from hurt feelings and embarrassment. All is forgotten when another hunter bucks in excitement, a maneuver garnished with an exuberant fart. Hunter Pace at Sweet Briar College with the Bedford County Hunt–no live quarry involved. Great fun! 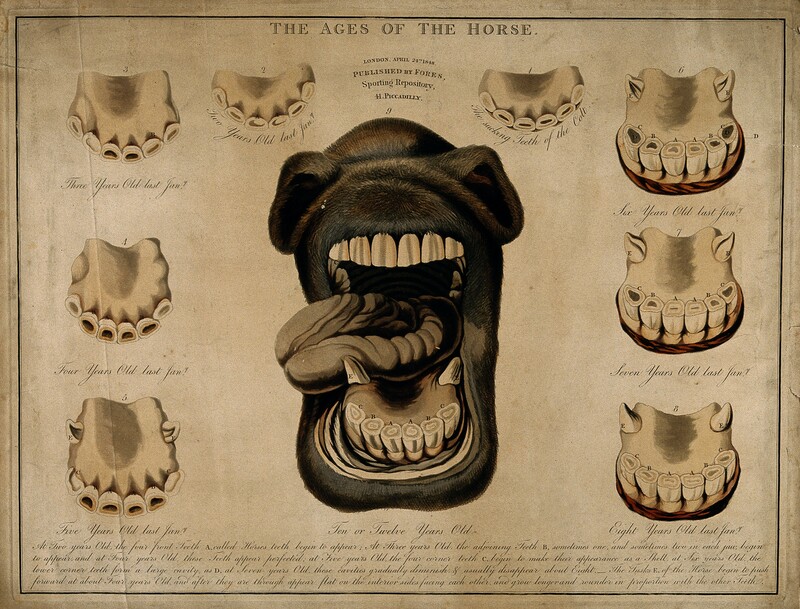 As in the last post, the focus here is less on the Regency era’s breeding and training of the hunter. Today we are more concerned with the hunter’s character, best displayed in the often-alarming atmosphere of hunting with hounds. Pierce Egan in his Anecdotes relates what happens when an experienced hunter is paired with an inexperienced rider. A young Oxford man was egged on by his colleagues to purchase a seasoned hunting horse for forty-five guineas. The November weather of that first hunt lulled our virgin Nimrod into a sense that fox hunting was wretched, boring work with a lot of standing around under dripping trees. That is, until the hounds scented the fox. His mount immediately perceived this and the next three hours were spent in a “state of torment,” as the rider was carried along helplessly, his hunter following the chase, over coop and hedge, and dashing down boggy lanes. Finally, he came to a stop so abruptly rider and horse parted company. No entreaties could persuade either of them to partner again. It cannot be said enough that horses have minds of their own. “..returning from a hard chase with his victorious horse Telegraph (which he bought of Lord Villers for 600 guineas) Sir Henry St. John Mildmay dismounted and told his groom he might venture to pat him; and accordingly [the Baronet] put his right hand towards his neck, when the horse instantly seized it in his mouth and held it there for over a minute.. 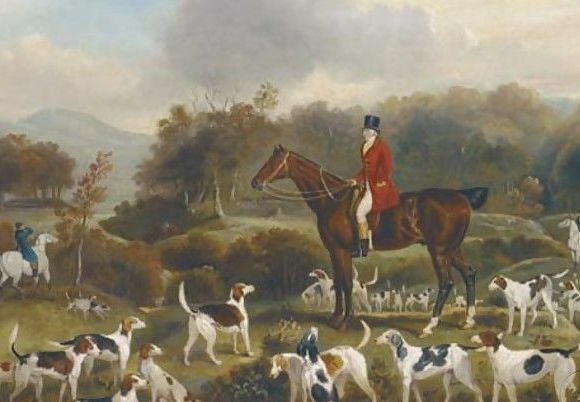 The Monthly Review of 1835 contains a lively essay of early nineteenth century fox hunting in England. Among the reports is that of one Reverend Marmaduke Theakston. In the heat of the chase, this man of God was thrown as he tried to ford the River Tees aboard ‘a spirited and powerful animal. ‘ One should never navigate by sawing on the reins. Horses know very well how to swim. Simply hold onto the mane, as the editor related his own personal experience. He was hunting with Sir Watkin Wynn aboard Thetis (goddess of water, yeah?) Left to her own devices, the mare saved him from being dashed and drowned amongst a stream’s boulders. 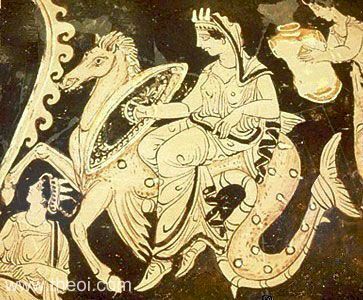 Thetis rides Hippocamp bearing her son’s armor. She appears quite often in English maritime history–twelve ships of the Royal Navy have borne her name.